A high-resolution sedimentological study of Lake Bourget was conducted to reconstruct the flood frequency and intensity (or magnitude) in the area over the last 350 years. Particular emphasis was placed on investigating the spatio-temporal distribution of flood deposits in this large lake basin. The thicknesses of deposits resulting from 30 flood events of the Rhône River were collected over a set of 24 short sediment cores. Deposit thicknesses were compared with instrumental data for the Rhône River discharge for the period from 1853 to 2010. The results show that flood frequency and intensity cannot be reliably reconstructed from a single core because of the inhomogeneous flood-deposit geometry in such a large lake. From all documented flood-deposit thicknesses, volumes of sediment brought into the lake during each flood event were computed through a Kriging procedure and compared with the historical instrumental data. The results show, in this study, that reconstructed sediment volumes are well correlated to maximal flood discharges. This significant correlation suggests that the increase of embankment and dam settlements on the Rhône River during the last 150 years has not significantly affected the transport of the smallest sediment fraction during major flood events. Hence, assessment of the flood-sediment volumes deposited in the large Lake Bourget is the only way to reliably reconstruct the flood frequency and intensity. 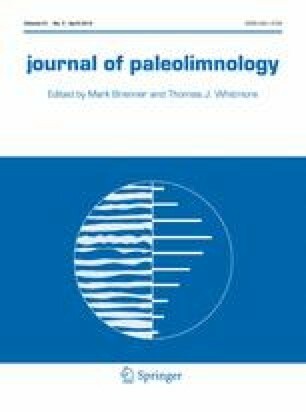 The authors are grateful to Grégoire Ledoux, CEN Université Laval, Québec, for providing the bathymetric map; to Jean-Paul Bravard for helpful suggestions; to Fayçal Soufi, EDYTEM, for help in making the thin sections; and to Cécile Pignol for help in the laboratory. This work was funded by the French National Research Agency (ANR) through research programs “IPER-Rétro” (ANR-08-VUL 005) and “PYGMALION” (ANR-07-BLAN-0133). J.P. Jenny benefited from a PhD joint grant of the ANR Iper-Rétro and from the Assemblée des Pays de Savoie. Bruno Wilhelm benefited from a PhD joint grant of the Communauté de Commune du Grésivaudan and the Assemblée des Pays de Savoie. This research also benefited from a grant from the Laboratory of Excellence (LABEX) ITEM in the framework of the research program “CrHistAl – Crue Historiques dans les Alpes”.